Particularly for textiles that come into direct contact with our skin, chemical residue should be a no-no. Because of their purely natural ingredients, eMC cleaners provide exceptionally gentle cleaning and also reduce the amount of detergent required. Curtains or textiles can also be directly sprayed. Gentle cleaning of all textiles, light textiles and curtains. Use as a pre-wash spray or leave to take effect and then vacuum off. Mix eMC Cleaner for Textiles with water in the spray bottle, spray onto textiles, leave to take effect for a short time, then wash off or vacuum. 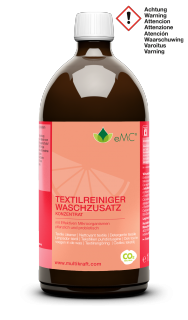 eMC Cleaner for Textiles can also be used on light coloured clothing etc. For stubborn stains, leave the spray solution to take effect overnight. To eliminate odours, spray a few puffs of EM Clear spray solution onto clothing, curtains and textiles. Gentle cleaning suitable for all textiles. As a washing additive, it enables the amount of detergent required to be reduced and simultaneously combats limescale in the machine. Place eMC Cleaner for Textiles in the detergent compartment and EM Ceramic Pipes Wash directly in the drum. EM Ceramic Pipes Wash activates the water, reduces its surface tension and thus makes it softer. The amount of detergent required is reduced by up to 50%. For washing lightly soiled clothing below 40°C, the detergent can even be left out completely. To preserve the microbiology in cesspools and small sewage works, fabric softener should not be used.